As you can probably tell from this incarnation of a blog that began in the last century, I like good television. Some shows I latch onto from the beginning (Jericho, Breaking Bad, The Sopranos, Rubicon), and others I discover later, after realizing my first impression wasn’t a good one (Sons of Anarchy, The Shield, Mad Men, Justified). 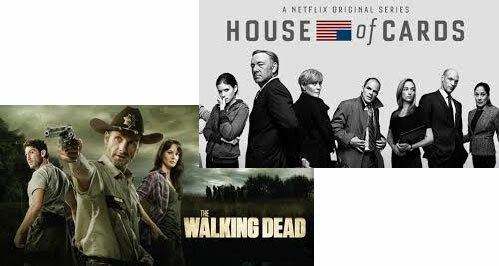 Recently, two more shows fell into the latter category, House of Cards and The Walking Dead. One is a show in which each episode attempts to make you throw up even more of what you ate that day, showing the blood, carnage and gore associated with the end of normal society, and its transition to a state of terminal inhumanity. The other is a show about zombies. I was disgusted and completely put off by both of these shows after watching approximately 20 minutes of their respective pilots. 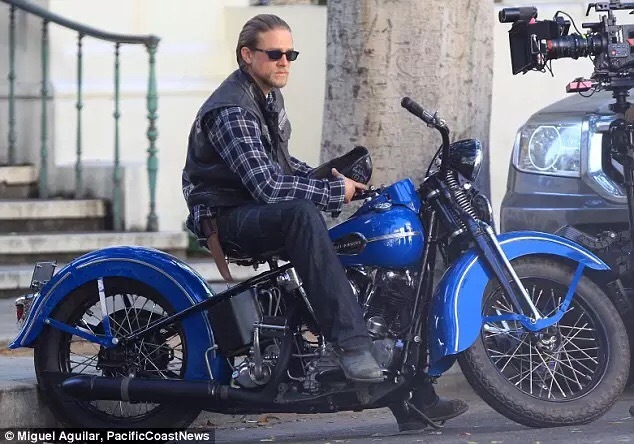 After hearing much critical acclaim, mostly from friends, I decided to give the shows second chances, and much like with Sons of Anarchy, once I got past the early minutes revulsion, I was hooked. In truth, these three shows, Sons, Dead and Cards share common roots. They are about power, politics and survival, and all have characters who are fighting the good fight, doing the right thing. Okay, I haven’t found anybody like that in House of Cards yet, but I’m only nine episodes in. There’s nobody in that show I’d vote for, but let me tell you, both Sons of Anarchy and The Walking Dead have a number of characters for whom I’d go door to door. In fact, there have been several “walkers” in Dead who would get my support if they were running against any of the politicians in Cards. And Sons? Let’s just say that if you see an SUV around town sporting a “Jax/Chibs 2016” sticker, that’s me. The point is, right now, we’re loving zombies, a fact reflected in the success of AMC’s gorefest. But that leaves me a bit unsettled, because since the dawn of electric entertainment, and accelerated by the beginning of electronic entertainment, hit shows and movies can inspire and influence our interests and behaviors. How many kids in the early 60s became pilots because of Sky King? The delightful Nichelle Nichols (I can say this because I’ve met and interviewed her a couple times – she’s the most delightful of the Trek actors, and that’s saying a lot, because George Takei, who played Sulu is pretty goddamn delightful himself) inspired, and through a program with NASA, actually recruited a number of women and African Americans to the space agency. In my own experience in the late 70s, because of my love of the TV show Starsky and Hutch, I wanted more than anything to drive a 1976 Candy Apple red Ford Gran Torino with a white strip. 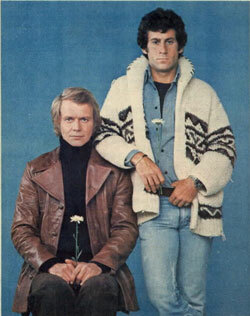 I never got my Torino though, and had to settle for a belted sweater jacket and a perm, the point being, shows that grab our attention, interest and devotion will inspire us in real life. A great example of this is legendary outlaw biker Sonny Barger, who when he took over a tiny, fledgeling group of motorcycle enthusiasts and moved them to Northern California, did so because he wanted to be like the fun-loving Lee Marvin character “Chino” from the Marlon Brando movie The Wild One. 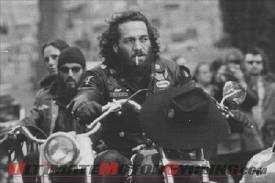 He loved the ideas of brotherhood and motorcycle riding in the movie, and was inspired to bring those things to his club, called Hells Angels (and by the way, there is no apostrophe in the name). 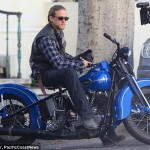 Yea, Brando’s movie wasn’t inspired by Hells Angels, it was the other way around. Even back then, TVs and movies could have a great influence over what we do and what we love. And that’s what scares the bejeezus out of me about House of Cards. As if we don’t already have enough criminals and sociopaths in Congress, do we really want to start attracting the kind of people who are excited by all the dirty-dealing they see in Cards? If there’s a zombie apocalypse, I’m all for a lot of people being prepared because, inspired by The Walking Dead, they learned to use a crossbow, but it’s tough enough watching the nonsense and criminality that goes on inside the Beltway and radiates outward to touch all of us, without worrying that Netflix, who produces and distributes the show, is sending up a red flare, attracting all who would hoodwink, fleece and otherwise sell down the river, good, hardworking, law-abiding Americans, to the city that already makes both Soddom and Gomorrah look like Mayberry and Hooterville. Please, watch House of Cards. It’s a great show. Kevin Spacey is beyond awesome. But if you’re going to be inspired by a show, and let it spill over into your real life, store up some food, guns and ammo and maybe use Google Maps to find a nice, comfy prison to call home when the Zombie Apocalypse hits. It’s a better use for your creative energies.